Medical gas systems in hospitals are, in a word, lifesaving. These assemblies supply piped oxygen, nitrous oxide, nitrogen, carbon dioxide, and medical air to hospital areas such as patient rooms, recovery areas, operating rooms, and more. 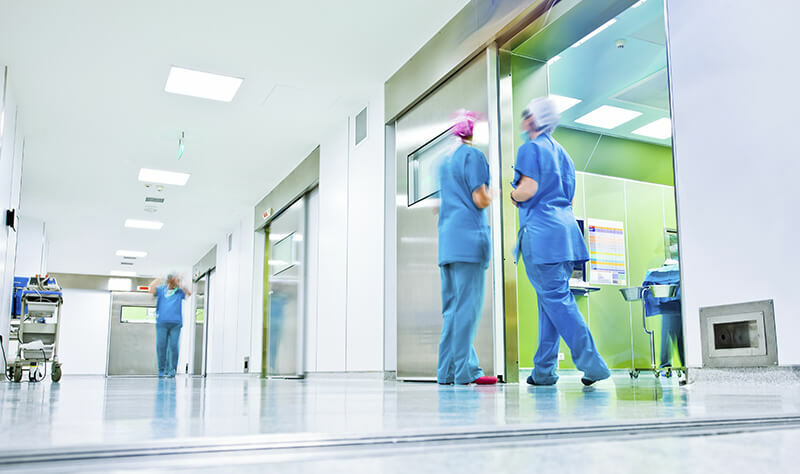 Computerized alarm systems monitor gas flow and alert hospital staff to any anomalies. There are main types of medical gas used in hospital environments. Oxygen: Oxygen is used when patients require supplemental oxygenation due to hypoxemia and hypoxia (insufficient oxygen in the blood). This system consists of a large storage system of liquid oxygen, which is then evaporated into a concentrated oxygen supply. Pressures are kept around 380 kPa or 55 psi. This arrangement is described as a vacuum insulated evaporator or VIE. For medical centers with a low patient capacity, oxygen is supplied by multiple standard cylinders, as opposed to evaporated liquid oxygen. Nitrous Oxide: Nitrous Oxide, or laughing gas, is used as an analgesic, and as an anesthetic for pre-operative procedures. Nitrous oxide is delivered to the hospital in standard tanks and is supplied through the medical gas system at around 345 kPa, or 50 psi. Nitrogen: Nitrogen is often used to power up surgical equipment during various procedures, and to measure a person’s response to a simulated aircraft cabin environment in pre-flight lung testing. This is known as hypoxic challenge testing. Nitrogen is also used as a cryogen to freeze and preserve blood, tissue, and other biological specimens, and to freeze and destroy diseased tissue in dermatology and cryosurgery. The Severn Group has experiencing working in all types of hospitals and medical facilities throughout Maryland. Carbon Dioxide: Carbon dioxide is used to suspend or inflate various tissues and is used in laser surgeries. Most commonly, carbon dioxide is used in abdominal and thoracic surgeries, where the surgeon may need to move various organs to get to one particular area of the body. Carbon dioxide can also be combined with oxygen or air for respiratory simulation and treatment of various respiratory disorders. System pressures are maintained at about 345 kPa, or 50 psi. Medical Air: This is supplied by a specialized air compressor to patient care areas. Clean outside air is pressurized to around 380 kPa, or 55 psi, and brought inside to the patient. Medical air should never be used as oxygen, and cannot be used for HVAC controls, or to provide power to surgery tools. Medical air is used extensively in the ICU, PICU, and NICU areas, and with pulmonary nebulizers to reduce the risk of excess oxygen in the lungs or other body tissues (known as hyperoxia), during mechanical ventilation or surgical procedures. Helium/Heliox: Helium is often used to treat fixed partial upper airway obstructions or increased air resistance. This will help patients breathe easier. It is also used in liquefied form to help MRI machines to reach a superconducting state. This allows the MRI to produce high-resolution body images without exposing the patient to radiation. Carbon Monoxide: This gas is only used in very trace amounts as an ingredient in lung diffusion testing. This test helps medical staff to determine how well a patient’s lungs are exchanging gases. In addition to these main gases, there are a number of medical gas mixtures. These are often used for patient diagnostics such as lung function, or blood-gas analysis. Test gases are also used to calibrate and maintain medical devices that are employed in the delivery of anaesthetic gases. Medical gases are also used in a laboratory environment. This is where bacterial cultures may be grown in controlled aerobic or anaerobic incubator atmospheres. Biological cell cultures or tissue growth can be controlled by aerobic conditions that use mixtures rich in oxygen. Conversely, anaerobic conditions are created using mixtures rich in hydrogen or carbon dioxide. It is necessary to establish a monitoring system to maintain a stable supply of medical gases. It should trace the gas flow from the source, through the piping, and to the various hospital outlets that use the gas. These systems should show the amount of gas remaining in the different tanks. It should also show the operating condition of the supply station, and the gas pressure applied to each area where the gas is in use. Also, the medical gas outlet that is used by medical staff should be designed so that it is impossible to allow a cross-connection to a different medical gas. Meaning, connecting a hypoxic patient to a carbon-dioxide supply. Systems have been developed that utilize pin patterns that will only fit into the correct female connector, as well as bright colors respectively designed to the particular kind of gas. Medical gas is disposed of via vacuum equipment, generally supplied by various vacuum pump systems that exhaust to the atmosphere. Continuous vacuum pressures are maintained around 75 kPa or 22 inches of mercury. Waste anesthesia gas uses the same vacuum pump as the medical vacuum system, but may be a separate line from the source. However, the line can be combined with the primary medical vacuum line. Waste anesthesia gas vacuum systems are maintained around 50-65 kPa or 15-19 inches of mercury. The Severn Group is qualified to install medical gas systems. If you have questions, or if you’d like to speak further about medical gas system installation, contact us.